Insurance is a topic that sends almost anyone heading for the hills. Face it, most of us would rather talk about anything... March Madness, the weather, annoying relatives, you name it... rather than insurance. But, if you have nice things, insurance is something that you really want to explore. Perhaps the most common misconception is that artwork, antiques, etc. 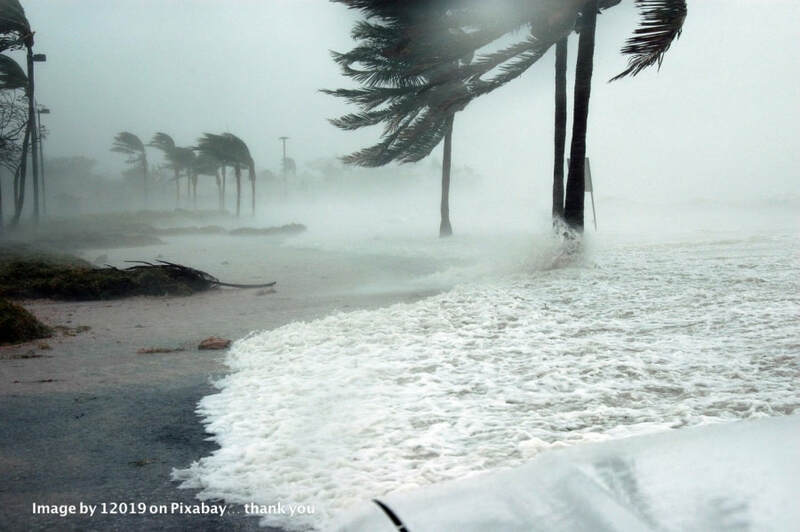 are covered by your homeowner's policy. In fact, that usually is not the case. To get coverage for your finer things, most insurance companies require a separate policy commonly referred to as a Fine Arts Rider. The value threshold will differ from company to company, so this is a conversation you definitely want to have with your agent. In most instances, insurers will require a written insurance appraisal for items covered by the rider. While that is good for appraisers like myself, you will want to do the math first to make sure the appraisal cost plus the rider cost makes sense relative to the items you wish to cover. For household contents, a great idea is to do an inventory, both written and digital. Save purchase receipts and scan them both to a flash drive that you can store off site plus on cloud server such as Google. Redundancy is your friend here! The easiest way to do the digital documentation is to do a slow 360 degree video of each room. Most insurance companies will do the right thing regardless but there is a lot of truth to a picture being worth a thousand words. How's Your Drink? A BRIEF history of American barware AND TODAY'S TRENDS. Adult beverages have been a part of American history from the very first days of the colonies. Taverns were key meeting spots and early accounts indicate that the settlers consumed copious amounts of booze of every sort, often locally distilled. 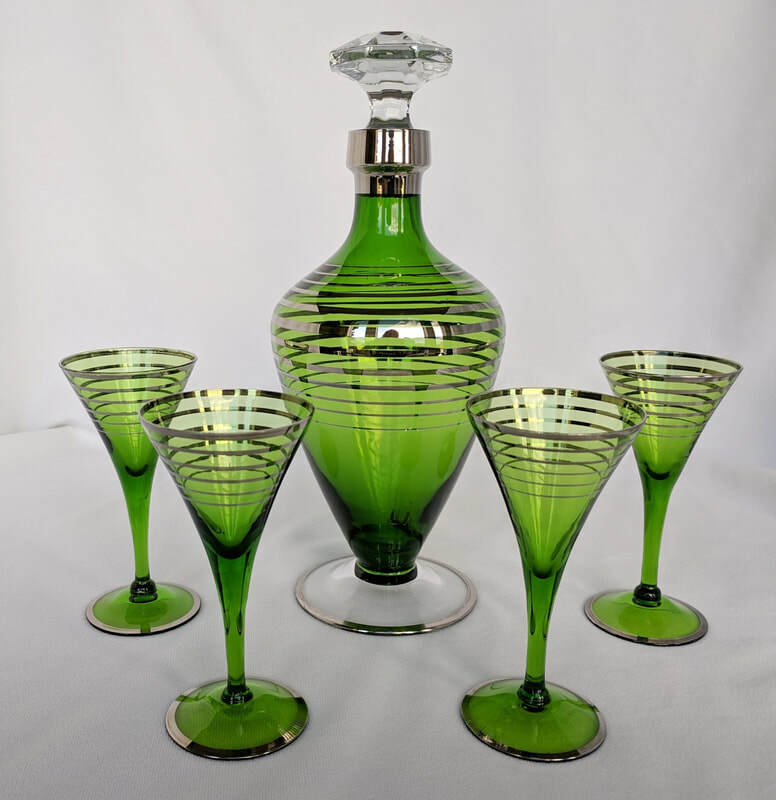 Thus, most of the early glassware made in the US was aimed at both the storage and imbibing of spirits, including the lovely "swirl" bottles made in Zanesville, OH in the early 19th century. ​One of my favorite early forms is an ale tumbler referred to as a "firing glass". These were tapered ale glasses mounted on a thick, solid discoidal base. Popular in lodge halls, the lodge members would pound the tables with them as a way of applause, although they were also probably a convenient weapon during the occasional brawl. With the introduction of sophisticated European wares in the late 19th century, American glass makers strove to produce equivalents here in the US. Some of the best forms were the amazing cut crystal glass decanters and whiskey tumblers made in Wheeling and other US glass centers in the late 19th and very early 20th centuries. By the 1920's, American glass houses were expanding into different colors and adding etches and overlays to their wares. Over time, fussy designs gave way to sleeker, more contemporary looks such as the 1930's Cambridge decanter set shown above. The advent of the Mid-century Modern era furthered this trend. Metal cocktail shakers became standard fixtures in homes along with contemporary highball and martini glasses to go with them. These latter pieces of barware have enjoyed a noticeable return to popularity thanks to the Mad Men TV series. Prices today across the barware field reflect this trend. Elegant crystal such as Waterford and Baccarat brings a fraction of what it used to. More popular instead among collectors and those just looking for fun barware are the mid-mod cocktail shaker sets and other pieces of barware with a contemporary look. Speaking as an appraiser, I expect this trend to continue for the foreseeable future. Ohio was home to many excellent glass houses in the late 19th and 20th centuries. One worthy of special note is the Cambridge Glass Company, which enjoyed a fifty-two year run from 1902 to 1954. Disclaimer: the fact that my wife has collected Cambridge for over 30 years has everything to do with this post. ​Started in the eastern Ohio town of Cambridge, the location was a strategic one due to the area being rich in natural gas and coal, which were needed for commercial glass-making. Also helpful was the hiring of Andrew Bennett as director, a native of England with years of experience European glass and porcelain markets. At the time of his hiring, Bennett had forged close ties to Boston and New York, two of America's most important cultural and retail centers at the time. Early pieces made by Cambridge were mainly utilitarian such as lamps, tumblers, and bowls. By the 1920's, however, the enormous popularity of the Art Nouveau and Art Deco aesthetics induced Bennett to largely eliminate heavy common pressed ware and instead expand into colorful opaque lines and lighter clear pieces. Also introduced at this time were many distinctive etches, including "Marjorie", which was named after Andrew Bennett’s daughter. ​For the next few decades, Cambridge Glass prospered due to the penchant for formal entertaining. There were glasses and serving pieces for every occasion as well as many etches aimed at brides looking to register a pattern. Just to illustrate the variety: within a single etch, iced teas, creme de menthes, low wines, tall wines, sherbets, and clarets, among other stemware. Cambridge also formed cross-ventures, including making perfume bottles for the DeVilbiss Company in Toledo, Ohio. Founded in 1905, DeVilbiss still exists today although they have long since changed from making perfume atomizer hardware to industrial paint sprayers. The war years and ensuing Mid-century Modern period saw sweeping changes to American culture but Cambridge likewise changed, introducing new colors and sleek, modernistic designs. One of the best known is the Square pattern, which was introduced in 1951 and highlighted by the Museum of Modern Art. Square was produced in both crystal and Ebon (a matte black called) and look like they would be something in which Don Draper's wife would proudly serve cocktails. Some of my previous posts have addressed estate sales and auctions when looking to sell items. Another option is selling items yourself through the various online platforms such as eBay. Depending on your situation, this may or not be a viable option. If it is, here are some venues and what I see as the plusses and minuses of each. ​Ebay is probably the platform everyone is most familiar with. When ebay first launched, it was revolutionary and catered primarily to small sellers looking to offer vintage and collectible items, including antiques. Over time, this changed and in the early 2000's a major revamp steered the company more to large-volume sellers offering pretty much anything. Further changes resulted in a shift to more and more "Buy It Now" listings vs. the standard auctions. As collectibles guru Harry Rinker once observed, ebay has essentially become an online retail store vs. an online auction platform. That said, ebay does remain a major force in selling. While the focus is no longer primarily on older items, many people do still buy and sell antiques and collectibles on ebay. The plusses that I see are the ability to set a reserve price, the likelihood of an immediate sale (if auctioning), and the ability to reach a wide audience. Other plusses are the way the listing process has become incredibly simplified and the sophisticated pricing tools that ebay offers. From my own experiences, the largest downsides seem to be a buyer base that I believe is looking for "steals and deals" and fees that now rival auction houses. Consequently, I would probably caution against listing items of significant value if you can instead get them to a reputable auction house, assuming a longer time frame is available to you. If you need the money pronto, however, then ebay may be more of an acceptable venue. Also remember to factor in shipping and transportation, especially for large items. ​Another option is selling on Etsy. Etsy has quickly shed its focus on artisan and hand-crafted items and now offers a staggering variety of items, both old and new. Listing fees are minimal and you can list as few or as many items as you like. Because Etsy is a retail only site, however, items may take a long time to sell or not sell at all. If money is needed in a hurry, then you will probably want to circle back to an estate sale or ebay. Other online selling platforms include store-format venues such as Ruby Lane and 1stDibs. I maintain a store on the Ruby Lane platform, Clark and Proctor Fine Arts, and originally created it mainly to do some personal de-accessioning. Over time, however, it has grown a bit and I now also offer to sell items for clients when they want to try to achieve something closer to a retail price. Since there is a monthly fee of about $70 and a required minimum number of items, this format is best suited for someone looking to consign. Likewise for 1stDibs which also requires a physical store location as well, last I checked. Lastly, for low-value items or just "stuff", there is always Craigslist. I have sold everything from a Honda CRV to tools and TV's on Craigslist and have always had a good experience. Just be sensible when using it though, and try to meet potential buyers in a neutral, well lit and populated spot. If you ever have stuff you simply want out of the house, use Craigslist's "Free Stuff" category and odds are, it will quickly go away. Everyone likes free stuff! 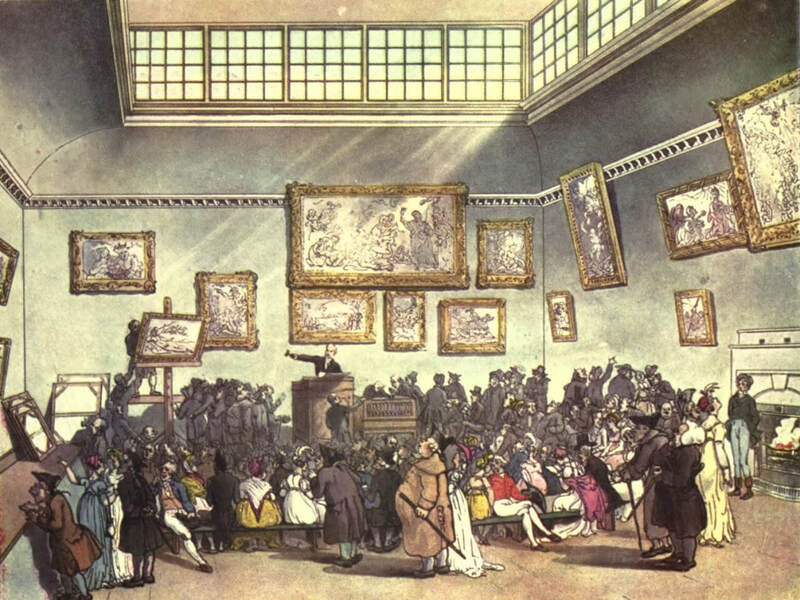 Auctions have been a means of selling for hundreds of years. They continue to be viable today and the internet has led to profound changes in the industry. For sellers, the advantage of online auctions is the ability to reach potential buyers worldwide. For buyers, the advantage is access to items on which they would never have had the opportunity to bid. At the same time, the sheer number of auctions and the volume of "stuff" constantly coming to market has helped to lower price points all across the board. So, if you are wondering if an auction is a good way to go or not, the answer to some extent is, "it depends". One big plus is that it can be a simple solution, particularly if you are in a "gotta go" situation. You sign the contract, the auction house picks up your items, and a few months later you get a check. The downside is that you often have no control over what your items might bring. For high-end items this is perhaps less of a worry since great pieces almost always bring good hammer prices. Lower-end items might struggle though or even fail to sell completely, though, so be pragmatic and have an idea of what you can live with before you consign. If you do decide to go the auction route, there are a number of things to keep in mind as you navigate the process. In no particular order, I have presented some of these in the following paragraphs. First, if you are looking to sell at auction, consider the sophistication of an auction house's online selling abilities when choosing a firm. The internet, as noted above, as been a complete game changer when it comes to the auction industry. Everyone from Sotheby's down to the mom-and-pop auctioneers who set up in your front yard are on the web in one form or another. People have become very comfortable with online bidding and thus the auction houses are continuing to direct more and more of their efforts in that direction. One factor that will go a long way in determining which firm you use is the nature of the items you wish to sell. High-end firms often have rough consignment valuation cutoffs north of $10,000, although exceptions are sometimes made. Below those firms are regional auction houses that will do well with items in the $500-10,000 range. For items under a $100, a local firm may be a good bet or even taking a DYI approach and selling items yourself on platforms such as eBay. Once you have narrowed your focus, you will want to carefully read the terms of the contract. The commission rate is obviously a major point but also look for nickel-and-dime fees such as insurance, photography, buy-in fees (should your pieces not sell), etc. Another thing to look for is when you can expect to get paid. Most auction houses will pay between 30 and 45 days and their contract should explicitly say this. Also do your homework but simply asking around and seeing what experiences other people have had with the company. ​A final thing to consider is what the auction house is known for. If you have general items, that may not factor into the equation. If you have something specific, though, such as a California impressionist work, then look to get the item to a California or western auction house. Online bidding has made this less critical than it once was but I still feel it makes sense to choose a firm that 1) is in the right geographical area if that pertains to your item(s) and 2) is known for what your looking to sell. Many auction houses specialize in things like old toys, illustration art, etc. and you will want to consider that when making your choice of auctioneers. ​This may seem like a daunting process but it really isn't that hard... it just takes some time and a little effort. And trust me, your financial outcome will probably benefit greatly from the efforts that you do make. In the meantime, happy selling! With more and more categories of items bringing less and less these days, it is very important to be strategic about how you bring items to market. The way in which you proceed will in many cases be governed by what, if any, time constraints you are under. If you are in the "gotta go" situation, as I like to call it, expediency is paramount. Typically this will be a situation where a deceased person's home needs to be cleared out for sale or someone is moving and they need to be out of the residence quickly. In the "gotta go" situation, an auction house may be a good bet since they will often arrange a pickup. Likewise, an estate sale may also be viable if it can be arranged quickly. In some instances, an estate sale company will pick up and store items if the sale cannot be arranged for the immediate future. When time constraints are not a major factor, a more deliberate pace can be set. Usually this will involve culling the most valuable items for individual sale and then arranging either an auction or estate sale for the remaining items. The advantage to this is that it gives a seller more time to explore options and find he best venue to obtain the highest price for the most valuable items. In an ideal scenario, there are no time constraints. In such a situation, a seller can place items at a leisurely pace in consignment venues or market via online platforms such as eBay. If the items don't sell, the seller can then adjust prices or simply re-list the items who convenient. From my own experience as an appraiser, the third situation is rarely one that I am working with. More often than not, it's the "gotta go" scenario and all that it entails. In my next post, I'll provide insights into each of the specific venues for selling (auctions, etc.) and share tips and strategies for a successful outcome. "A tsunami of stuff" is how a colleague of mine aptly describes what is currently washing into the marketplace for vintage and antique goods. As baby boomers such as myself age and downsize, more and more collections are coming to market. The unfortunate reality, however, is that there are fewer and fewer buyers who want these things. The Millennial and I-Gen cohorts in particular want little to do with traditional things such as silver, china, crystal, and period furniture. For many of them, it is merely clutter. Anything that will not go into the dishwasher or needs polishing is particularly anathema. This in turn has caused significant drops in price for most categories. It has also caused a great deal of angst for people who were either counting on their children to inherit and cherish heirloom items or else had thoughts of garnering a tidy nest egg at sale time. Both are increasingly uncommon scenarios, however. And, it is something that I frequently encounter when helping clients downsize or bring their treasures to market. My advice to everyone in such a situation is to first be pragmatic. What someone paid for an item in 1985 has no bearing on what you will receive for it in 2017. The digital era has upended literally centuries of tradition in passing down items and it is important to understand this. Where markets will ultimately settle is hard to predict but for now, the trend is still downward or flat. A second piece of advice is to look closely at donation vs. selling. Depending on one's tax situation, the depressed prices for many things such as early furniture may make it more financially advantageous for someone to donate a piece as opposed to putting it at auction, where a commission will be taken out. So, be sure to do your financial homework before deciding on a course of action. ​If selling does make sense, consider your financial needs and time frame. If time is short and/or money is needed, it may make sense to just send everything to auction and be done with it. If you have the luxury of time and are so inclined, piecing things out via online platforms or through consignment stores may be a better route to go. As always, each situation is going to be different but the key takeaway is to carefully consider your situation before moving forward. In my next post, I'll share some insights into ways of getting the most money for your items if you do decide to bring them to market.